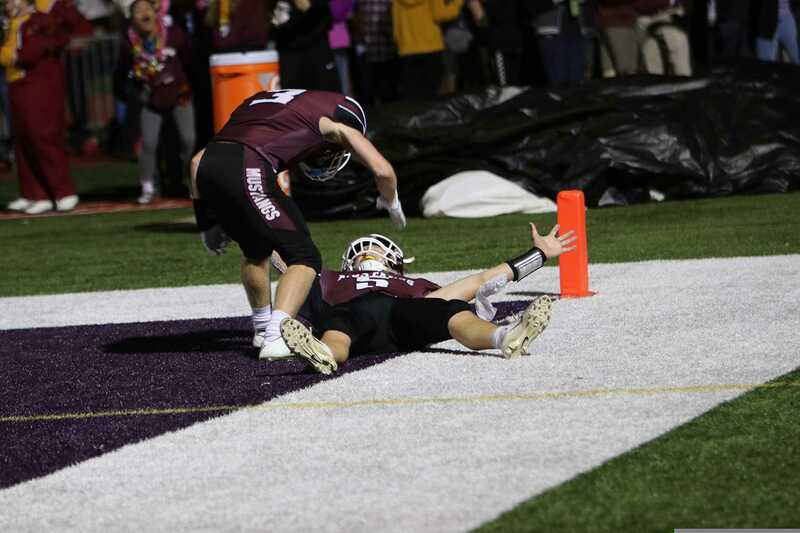 Seniors Blake Booth and Paul Ryan celebrate a touchdown by Ryan in the second quarter Sept. 7 against West Delaware. Photo by Caroline Voss. 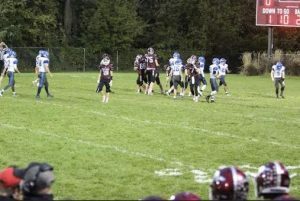 With two seconds left, Paul Ryan rushed into the endzone with a hook and ladder play to beat the West Delaware Hawks, 35-33. Video of the play by Andrew Sherry, posted by Coach Preston Pedersen, has racked up over 3,000 views on Twitter. Just three days later, the staff realized that a mistake had been made. 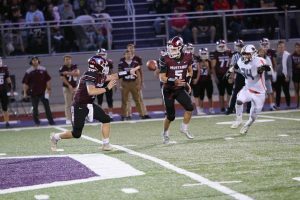 A player participated in both the freshman-sophomore game and the varsity game for more than five quarters, which violated the rules of the Iowa High School Athletic Association. 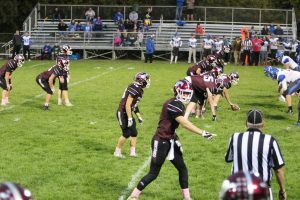 The Sept. 7 game will be recorded as a 2-0 loss to West Delaware by forfeit. The players are also taking the mistake in stride. 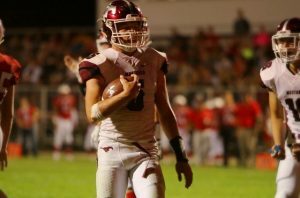 “Even though the game was reversed to a loss, I still think we made a lot of growth as a team and I think these early season challenges will help prepare us come district play,” explained senior wide receiver Mitchell Louwagie. They were prepared to win on Friday. After a few games of getting in the groove, they figured it out, just in time. 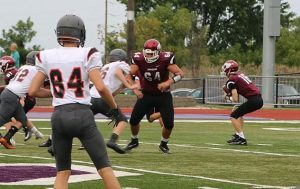 “Coach Pedersen told us that everyone needs to do their job, and if everyone does their job, we will be successful at the end of the night,” said Aydan Holub-Schultz, a junior defensive tackle. 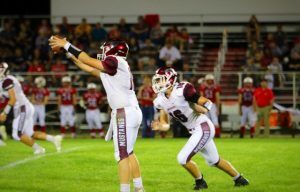 The Mustangs went into their third game of the season against No. 4 ranked West Delaware, and they knew it would take everything they had to win. 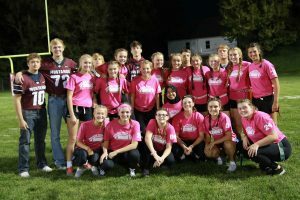 In the end, it was senior Paul Ryan and junior Zach Baker who completed the hook and ladder play with just two seconds left to win the game. Both teams came onto the field ready to play; the score was already 7-7 after just five minutes into the game. After Nick Casey picked up a fumble forced by Wyatt Stanbro, the Mustangs were up 20-14 at the half. Each team took turns scoring and defending throughout the entire second half. With 2:02 left in the game, West Delaware was up 27-23. A fourth-down score by Brady Ketchum to Blake Booth puts the Mustangs up 29-27. With 24 seconds left, West Delaware scored to make the score 33-29. Two seconds were left on the clock, and the Mustangs called the timeout. Coach Preston Pedersen called a new hook and ladder play as the last play. 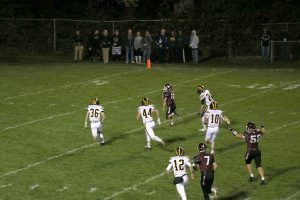 The ball flicked from Brady Ketchum to Zach Baker, and continued on to Paul Ryan for a 42-yard dash to the endzone. 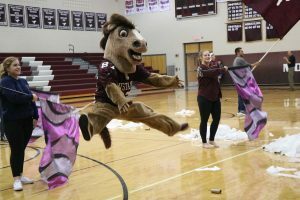 The Mustangs overcame the Hawks 35-33 in what they celebrated as a thrilling victory, which turned into a forfeited game. Maquoketa hosts the Mustangs tonight at 7:15. Mustangs Win Against Maquoketa, 42-7. Sept 14.